If you don't know I am a huge fan of Ubiquiti and UNIFI. Since some time I've been running on Unifi 5.9.X alpha/beta versions and one problem it has is that it specifies you need MongoDB on version 3.4. Unfortunately with Ubuntu 18.04 that's no longer the case. So if you try to install package it will complain and tell you that your MongoDB version is too high. 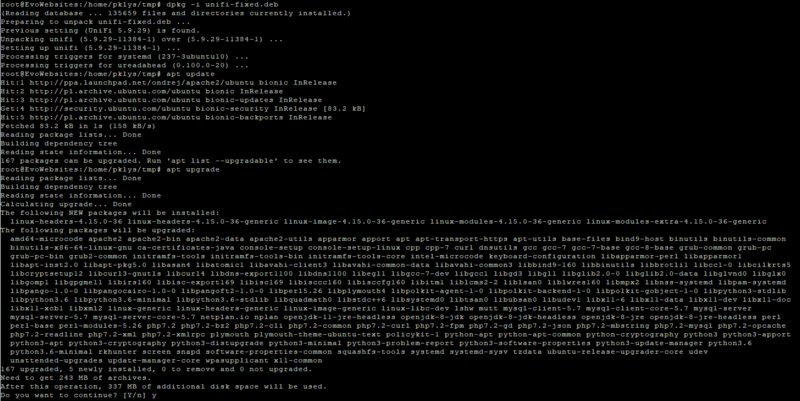 You can of course overwrite it by telling dpkg to ignore dependencies and so I did and I'm happy user of Unifi 5.9.x. The problem with this approach is that when you do that next time you try to update your system (not Unifi) you will get an error that Unifi can't upgrade and so any updates to your system are denied until you fix them. That's very unfortunate drawback and caused me to consider downgrading MongoDB to 3.4 or search for alternative solutions. And at this point there are many solutions on Unifi forums telling you how to install/use MongoDB 3.4 on newest Ubuntu system. But for me this would mean I would have to uninstall Unifi, fix MongoDB, reinstall… just too many steps. And after all my Unifi works just fine on MongoDB 3.6! Since this is a process that has to be repeated over and over again, I decided to write a short PowerShell module that fixes it each time for you. There's another blog post about it. I know you may not like PowerShell being installed on Linux but it works just fine, and it's something I'm skilled at. Easy to use, works on all platforms. What's not to love? And that's it! Easier said then done you say… well here it is… a simple step by step. Ubiquiti UniFi server is a centralized management system for UniFi suite of devices. After removing those 2 lines you must repackage unifi.deb. dpkg-deb: building package 'unifi' in 'unifi-fixed.deb'. Now all that is left is try if the Unifi package actually installs over currently installed one! Previous setting (UniFi 5.9.29) is found. After that… simply rerun apt update, apt-upgrade and it will work! 167 upgraded, 5 newly installed, 0 to remove and 0 not upgraded. Need to get 243 MB of archives. After this operation, 337 MB of additional disk space will be used. And we're done. Unifi 5.9.29 on Ubuntu 18.04 with MongoDB higher then 3.4 version and no complains from APT!